From Mar 18 to Apr 18 every dollar that you pay towards a credit card bill will earn you 5x Paytm Bonus Points. 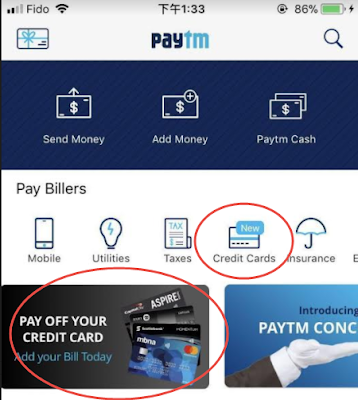 1 Paytm Point for every $1 spent on a credit card bill payment will be credited instantly, and the 5x Bonus Points will be credited to your Paytm account on Apr 25, 2019. For example: a $500 credit card bill payment will earn you 500 Paytm Points instantly, and a *bonus* of 2,500. 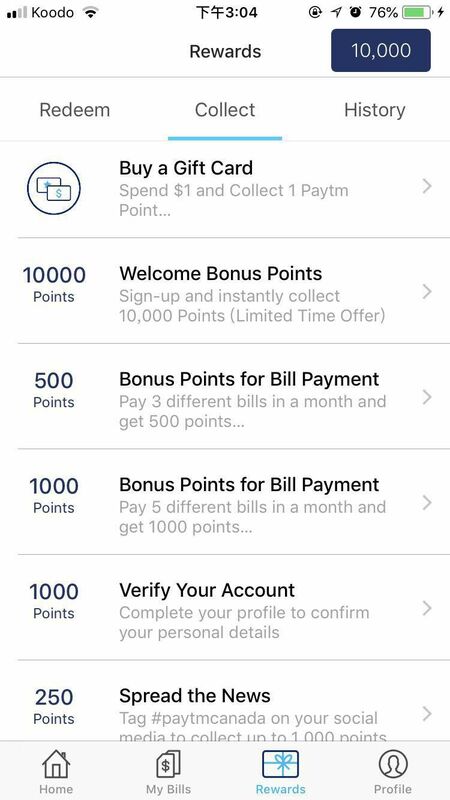 You will earn 5x Bonus Paytm Points on your first $1,000 of credit card bill payments for a maximum of 5,000 bonus Paytm Points. If any codes are not valid anymore, or if you have any new codes, please provide your comments below. Thanks. 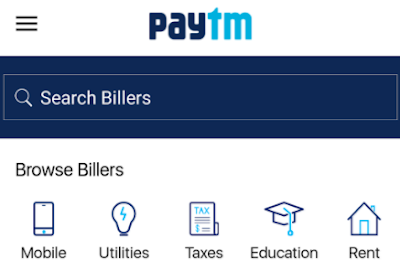 There is a Android/iOS app called "Paytm Canada", and you can pay most of the bills through this app. 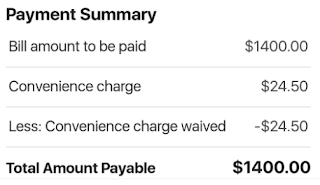 The good thing is you can link your credit cards to pay the bill, so you will get cashback/points which are not common when paying certain types of bills (just like the Plastiq service). Paytm is current not available in QC. For example, you can use Paytm to pay property tax, Utilities, Education tuition etc.. You can search your billers in the app. Same as Plastiq, you will need to pay a convenience fee for the payment. 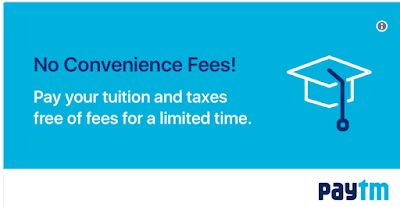 But another good thing is Paytm is waiving this fee now (for a limited time!!!). 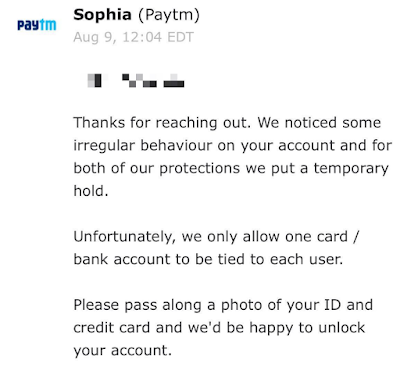 Paytm is a legit company and its app is very secure. I have tried this PayTM app a couple of times and I am very satisfied with it. If you want to register a new Paytm account, please use our website referral code: PTM8933000, Thanks. BTW, if you see any issues with code PTM8933000, please let us know (canadianrewards@gmail.com) and then try code PTM6413066. Thanks. As a new user, you will receive 1000 welcome bonus points first and you will get an extra 5000 points when you make your first payment of $50. After you registered with Paytm, you can get your own referral code and share them with your friends. Updated: I just paid my property tax using Paytm with my AmEx SPG card. Service fee $24.50 was waived and I got 1400 SPG points (value > $35) and one $2 Tim Hortons coupon for FREE. Honestly speaking, the service fee is only 1.75%. It is worth it, even the fee was not waived. 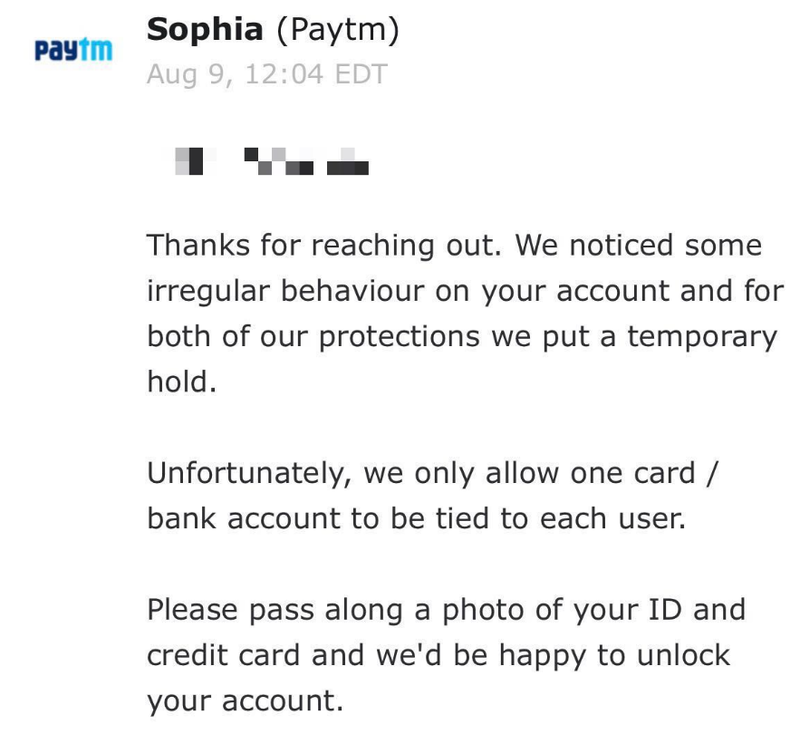 Updated on Aug 9, 2017: If you pay large bill in Paytm, they may ask you for a photo of ID and credit card. 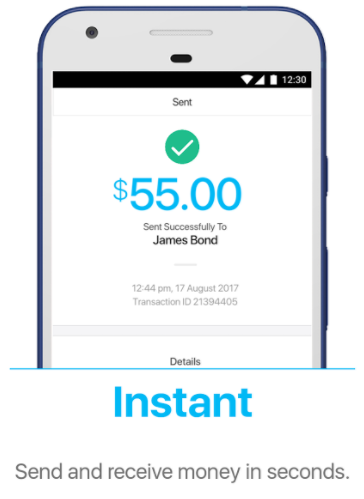 Paytm added a new function in the App today (Aug 9, 2017). 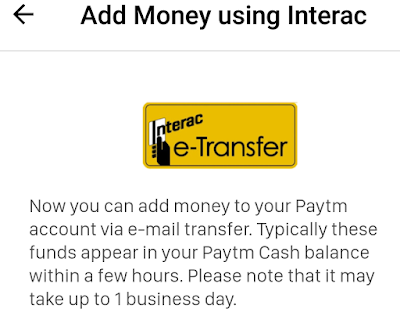 You can add money to your Paytm Cash using Interac. It is a good function if you don't have enough balance in your Paytm Cash. Updated on Oct 12, 2017: Paytm just introduced a Concierge Service. They can help you to set up your bills and link your bank account if you don't want to do it yourself. Updated on Oct 26, 2017: Paytm is amazing. It has launched a new features: the ability to pay your credit card bill. They can support bill payments for all major credit cards issued by Canada banks (still no convenience fee)! Of course, you can only use your linked bank account or Paytm cash to pay the credit card bill. I just paid my TD credit card bill with my Paytm Cash, and it shows payment accepted. So, the Paytm Cash is really CASH now! 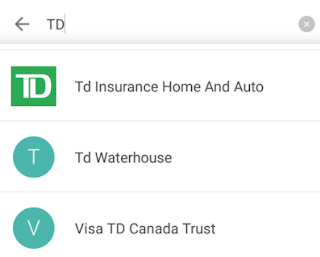 I also found TD Insurance and TD Waterhouse in Paytm payee list. I am happy that Paytm is getting better and better every month. Updated on Jan 5, 2018: Effective today, Visa credit cards will be suspended in Paytm. In addition to this, starting today, American Express cardholders will also notice a fee (around 4%) when they use Paytm to pay a bill. 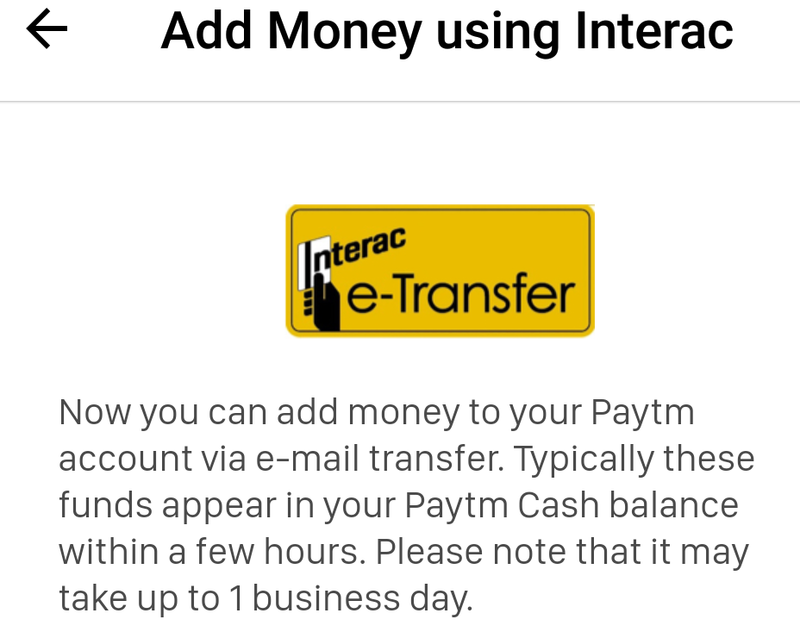 You can still use the Paytm app to pay a bill with any bank account in Canada, your Mastercard credit card, your bank debit card (Mastercard and Interac) and Paytm Cash. Updated on Feb 26, 2018: Paytm will introduce a new loyalty program soon: Paytm Points Program, which will replace the current Paytm VIP Program. If you are already a Paytm customer, you don't need to apply to the Paytm Points Program again. When Paytm officially launches it, every Paytm customer will be automatically transitioned into the Paytm Points Rewards program. Your Paytm Points will be retrospectively accumulated for you so whether you’ve been a customer for twelve months, one month or somewhere in between. You will not only earn Paytm points when you make a bill payment of $25+, but you will earn rewards from your credit cards too. So, you can get double the points for doing something you would normally do. When you make a minimum bill payment of $25 for one account in one month, you’ll receive 100 Paytm Points. 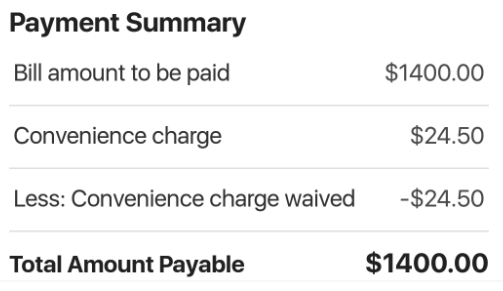 If you want to bump up your Paytm Points to 500, then make three different bill payments of at least $25 to three different accounts such as Shaw Cable, Bell TV and BC Hydro in one month. 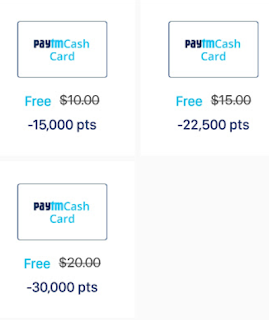 For 1,000 Paytm Points you’ll need to make five different bill payments of at least $25 to five different accounts in one month. For example Fido, Bell Mobility, Enbridge, Property Taxes and TD Home & Auto Insurance. It seems that we should be able to see this new program in Mar 2018. You can check that in the Paytm App "Paytm Rewards" section. 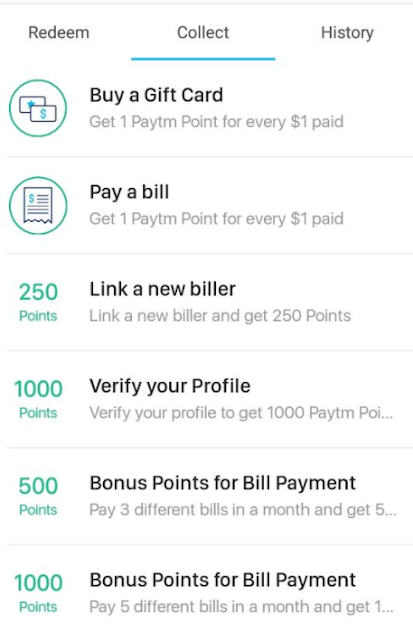 Updated on Mar 18, 2018: Paytm Rewards is now effective. You can check it in the Paytm App "Paytm Rewards" section. If you already have a Paytm account prior to the Effective Date of these Reward Terms, you will automatically get some points based on your account activities before. So, many people got a few thousand points on Mar 17, 2018. Note: Maximum Points per month for payments to companies are given in the table below. If you want to redeem your points, you can check your Paytm App => "Paytm Rewards"=>"Redeem". You can redeem up to a maximum of 20,000 points in a single transaction. Your Points can be exchanged for cashback on the available products and services provided by Paytm through the Paytm App. 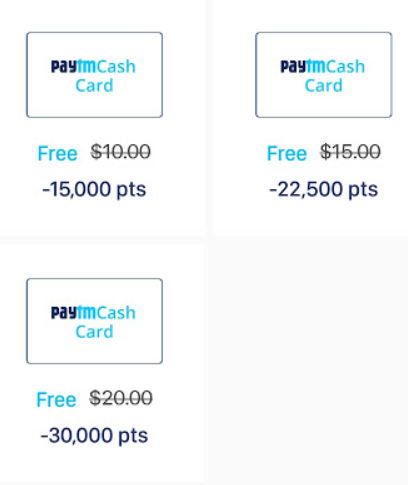 If you elect to redeem your Points, the number of Points you decide to redeem will be deducted from the total number of Points available for redemption and the equivalent cashback value will be deposited into your Paytm account and can then be used to initiate a Paytm transactions but cannot be transferred to your bank account or otherwise be withdrawn as a cash. From time to time, Paytm may offer special redemption campaigns. These will be subject to any additional terms as specifically described in the campaign offer. Updated on Sep 1, 2018: Now you can redeem Paytm Points for Paytm Cash and gift cards. 1) Starting today, you can convert your Paytm Points for a Paytm Cash Card; which can instantly be used towards a bill payment, rewards card purchase, or to send money nationwide. 2) Buy rewards cards using your Credit Card. Before today, you were only able to purchase reward cards with your Paytm Cash or your linked bank account. Now, you can use your credit card too! 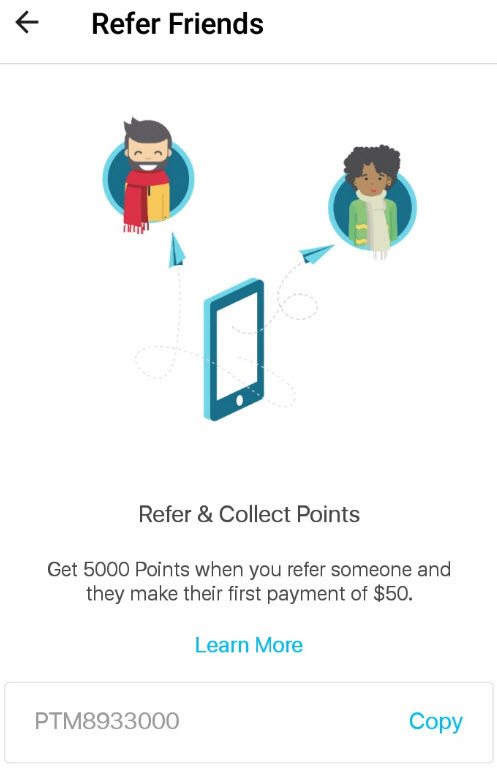 Which means that you can double up on points (if you collect credit card points) when buying yourself a reward. That sounds like a win-win to us. 3) F-R-E-E Rewards! This means that you can collect your points and redeem them for free rewards cards. Each brand offers a different “free reward” depending on the amount of Paytm Points you want to redeem. You can choose different kinds of gift cards, including Esso/Amazon/Tim Hortons/Uber/Best Buy/Cineplex etc. I like the Amazon.ca gift card. The ratio is 10000 Paytm points for $10 gift card. Updated on Feb 24, 2019: Paytm now accepts Visa Debit for the following bill payment categories: Mobile, Utilities, Taxes, Internet and Cable. You can also use your Visa Debit to purchase an e-gift card from Paytm Rewards section. Why Visa Debit? 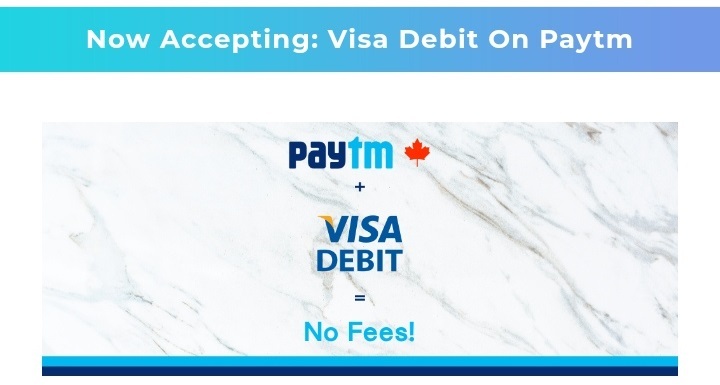 Visa Debit allows Paytm customers the ability of paying with a debit card with the flexibility and added security of paying with a Visa. 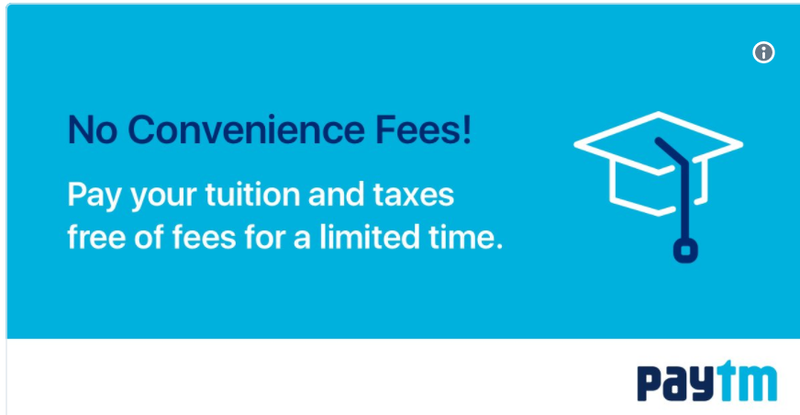 And there are no fees (no hidden fees, no convenience fees and no service fees) for using your Visa Debit. BTW, If anyone wants to leave his/her Paytm Promocode below, please use the following format ONLY: "My Paytm Promocode is: *******. Thanks." Other codes will be deleted. Thanks.